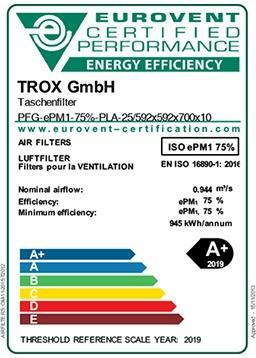 All TROX fine dust filters of filter classes ePM10 > 50% to ePM1 > 90% are Eurovent certified. 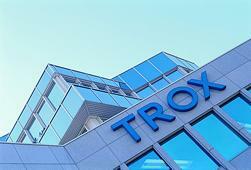 In-house manufacture and development in Germany provide customised solutions and ensures problem-free combinations with all other TROX components and systems. TROX filters impress thanks to their high efficiencies paired with low pressure drop differential and long service life. They thus make an efficient contribution to reducing energy costs. Considered over the lifecycle of a filter, around 60% of overall costs are due to the energy consumption. Although filters themselves do not consume power, the pressure drop differential they cause in an air handling unit must be compensated through higher output of the fans. In order to be able to evaluate the energy consumption and hence the efficiency of a filter, as part of its certification programme Eurovent Certification has published an energy classification scheme for air filters, developed in collaboration with leading manufacturers of air filters. With the replacement of the European filter standard EN 779 with the international standard ISO 16890, a new test procedure has been introduced for classifying efficiency, which is substantially closer to real conditions. 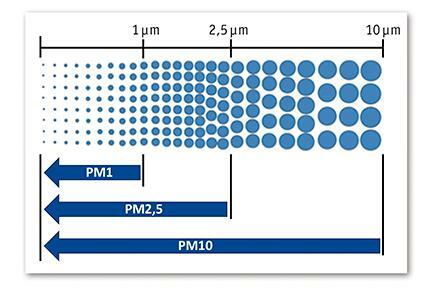 The new subdivision into three categories – PM10, PM2.5 and PM1 (see adjacent diagram) – made it necessary to have a new energy classification scheme to evaluate the energy consumption of a filter within its class of performance. Was ändert sich mit der DIN EN ISO 16890? To evaluate the energy efficiency, the filter is uniformly loaded with the newly defined ISO A2 fine dust. The increase in pressure drop differential within dust feeding of the filter is measured. The size of the dust feed differs depending on filter class. 200 g is thus fed in for ePM1 air filters, 250 g for ePM2.5 filters and 400 g for ePM10 filters, and an evaluation is subsequently carried out. To determine the energy consumption and classify the air filters, Eurovent adopted the previous calculation conditions with no changes. As before, the energy consumption of an air filter is directly dependent on the average pressure drop differential during the dust feed. The figures give the annual energy consumption in kWh (AEC = annual energy consumption) using the standard test and calculation conditions. 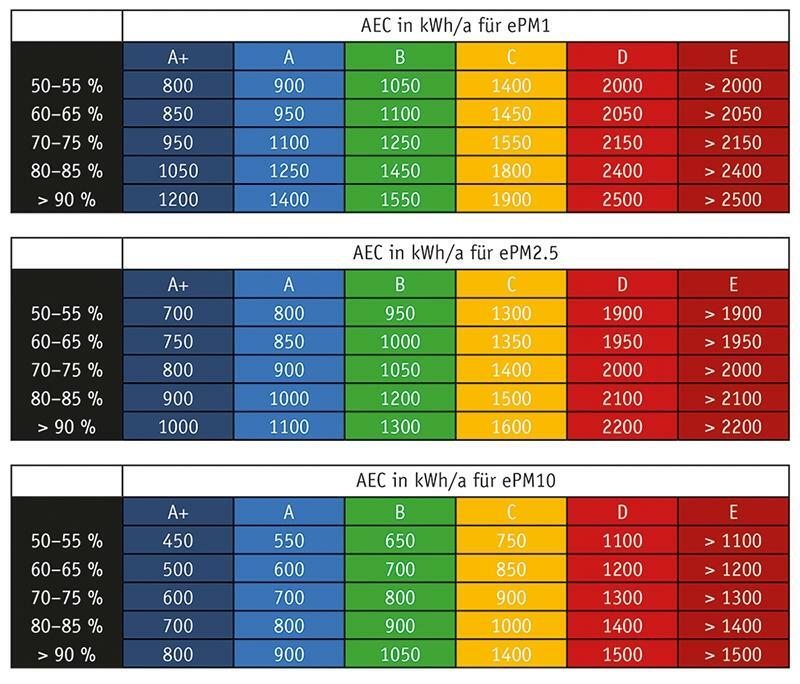 As the table shows, air filters of the worst class E consume twice as much power as those in the best class A+. Click here to enlarge the table. If, for example, you compare an air filter of category ePM1 > 50% (formerly F7) of class A+ having a energy consumption of maximum 800 kWh with a filter of class D having a energy consumption of maximum 2000 kWh, at an energy price of (just) 15 cent/kWh the energy costs are €120 per year for energy efficiency class A+ compared to €300 for class D. The difference amounts to €180 for a single filter element. 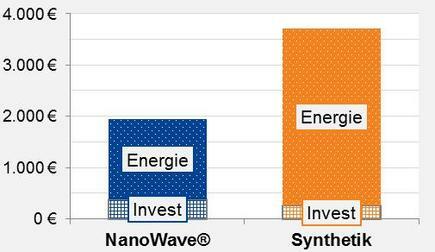 DO YOU INTEND TO OPTIMISE THE ENERGY EFFICIENCY OF YOUR SYSTEM?